Rugby fans and players alike are being urged to dust off their boots as the latest SecureTrading 24/Sevens event swings into Worthing. The club are on the lookout for teams to enter their latest event - taking place on Saturday - with participants and spectators encouraged to stay on for England’s Test match against South Africa later in the day at Raiders' Roundstone Lane ground. 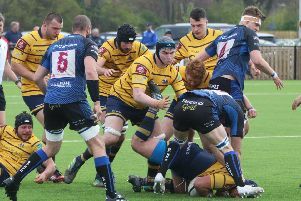 More than 40 years of sevens history is held at the Sussex club and, with entries open to teams of any level and skill, another excellent day of rugby is set to be in the offing next weekend. “We want to have people come and play and then be able to finish in time to watch the England versus South Africa game, we’ll then have a barbecue and some fun activities followed by some live music so it should be a good day out,” explained commercial and financial chairman Barny Hall. “We want to get as many local teams as possible, we’ve got teams from Brighton and Burgess Hill hopefully coming so if we could get more people involved from close by that would be excellent. We’ve always had a sevens tournament, but at this time of year it’s something different so if it goes well we can hope to get it bigger and better as the years progress. Cost of entry is £50 per team and if you attend on the day money will be given back as bar credit. National finals will be held at The Recreation Ground in Bath on Saturday, July 28.